You may trash this card. +1 Card; +1 Action; +1 Buy; + 1 Coin. You always get the +1 Card and +1 Action when you put this card into play, and can look at the card you draw before you have to make the decision to trash this or not. However you have to make the decision before moving on to other Actions or other Phases. You cannot retroactively trash this later in your turn. If you decide to trash it, it is removed from play, and you must make the choice immediately which effect you would like to have happen. 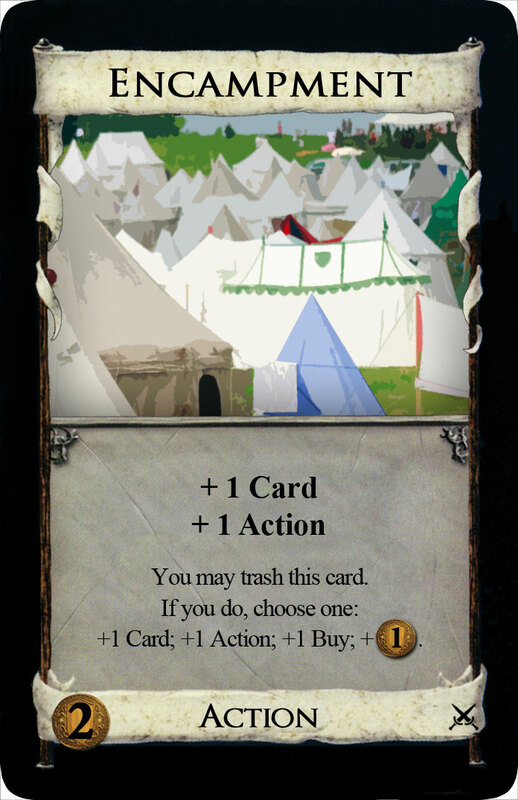 Although the Encampment card is trashed, it still counts as you having played an Action for the purposes of cards like the Peddler. Copying this card via Throne Room or King's Court will not allow you to trash it multiple times, although you will still get the +1 Action and +1 Card for each copy. Each other player discards 4 cards. The player who discarded a Treasure with the highest cost gains this from play, or if there was no highest, the player to your left gains it. Each player (including you) draws 3 cards. You discard 1 card and everyone else discards 4 cards. If a player has fewer than 4 cards in hand, they discard all the cards they have. Pay attention to the costs of any Treasure cards in these discards, and put the highest costing one into the discard pile last to help keep track of it. If any player discarded a Treasure with a cost strictly higher than any other player's discarded Treasure (taking Potion costs into account, if playing with Alchemy), they gain this copy of Mercenaries from play into their discard pile. Highest cost refers to the cost to buy the Treasure card, not the worth it produces when buying with it. If there is a tie for the highest costing Treasure, or it is unclear due to Potion costs, or no Treasures were discarded, the player to your left gains this. If you have the highest costing Treasure, you gain the Mercenaries from yourself, putting them into your discard pile immediately. Although the Mercenaries card leaves play right after being played, it still counts as you having played an Action for the purposes of cards like the Peddler, and you have still spent an Action to play it. After Mercenaries leaves play, the last effect still resolves, and all players gain 3 cards. Each player chooses a Kingdom card to be Forbidden (put its randomizer on the mat). At the start of your next turn, empty the mat. When any player plays a Forbidden card, they gain a Curse. There is a single play mat to hold the Forbidden cards, which is shared by all players. When any player selects a card to be Forbidden, put its blue backed randomizer card onto this mat to indicate this. The cards are placed face-up for all to see. 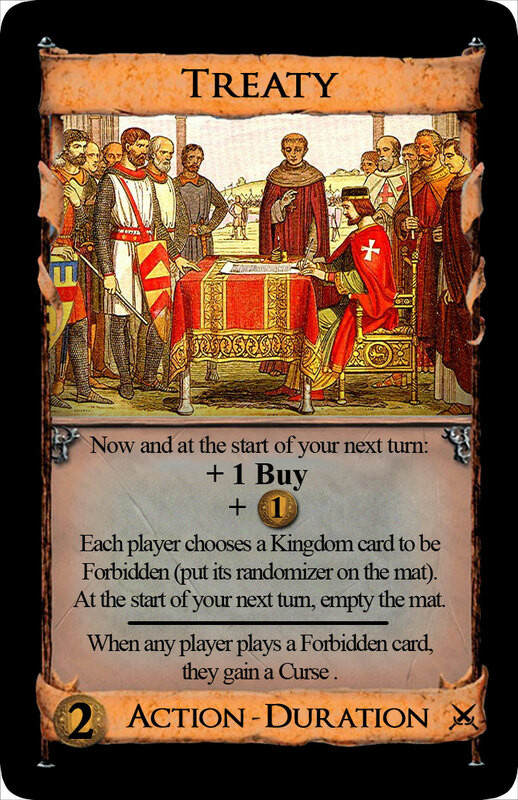 Only Kingdom cards may be chosen; standard Supply cards, such as Treasure, Victory or Curse; or cards such as the Prizes from Cornucopia cannot be Forbidden. Apart from that, there is no distinction made between card types — a Victory card may be Forbidden just as an Action or Treasure card could (although a Forbidden Victory card is unlikely to trigger the penalty, unless it is also an Action or a Treasure). 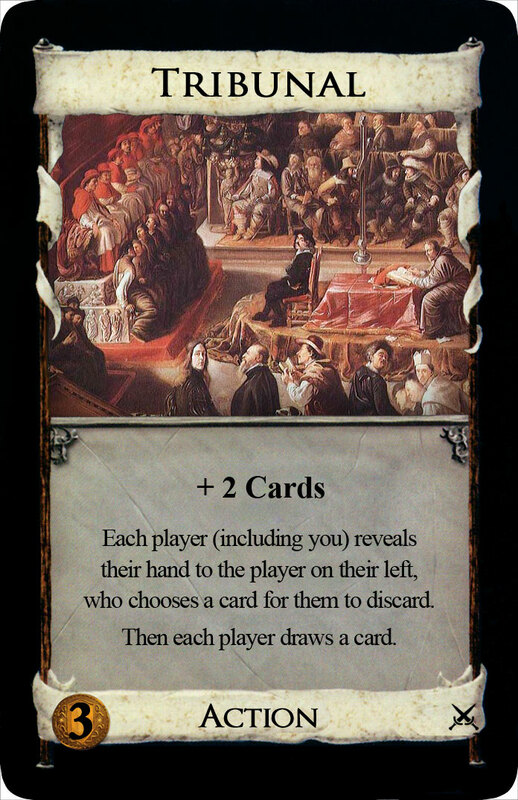 Players may choose a card which is already Forbidden, which has no additional effect, the Curse penalty remains the same. Treaty itself may be chosen as a Forbidden card, but this will only affect copies which are played after the current Treaty. Playing any copy of a card on the Forbidden mat causes the player doing so to gain a Curse each time they play the card. For example, if any player plays a (Forbidden) Village multiple times, they must gain a Curse each time. If they then played a Witch (which was also Forbidden) they would gain an additional Curse. A Forbidden Reaction would cause the penalty when revealed, just as an Action would when played on the table. You gain a Buy and 1 Coin this turn and next turn. This card is a Duration card and will remain in play until the Clean-up your next turn, when it will empty the 'Forbidden' mat of all cards. It doesn't matter if more cards have been Forbidden with other copies of Treaty, the entire mat will still be cleared. The 'Forbidden' mat contents are independent of any Treaty cards. If a Treaty card is removed from play before it has a chance to clear the Forbidden mat, then those cards will remain Forbidden until such time as another Treaty clears the mat. Each other player trashes a card from his hand. He gains a Copper per Coin in the cost, putting them into his hand. Each player chooses which card he or she will trash. The Coppers are gained into the player's hand, so if Cannon is played multiple times in a turn, players can trash the Coppers they have gained from a previous attack in response to a new attack. Potion symbols are ignored, only he Coin values are counted. A player's hand can exceed the normal size because of this. For example, if a player chose to trash Possession they would gain 6 Coppers into their hand. Reactions which affect gaining cards such as Watchtower or Trader can be used in response to the gain. Trashing a card with zero cost, such as a Copper or cards with costs reduced to zero by the Bridge wouldn't cause the gain of any cards. 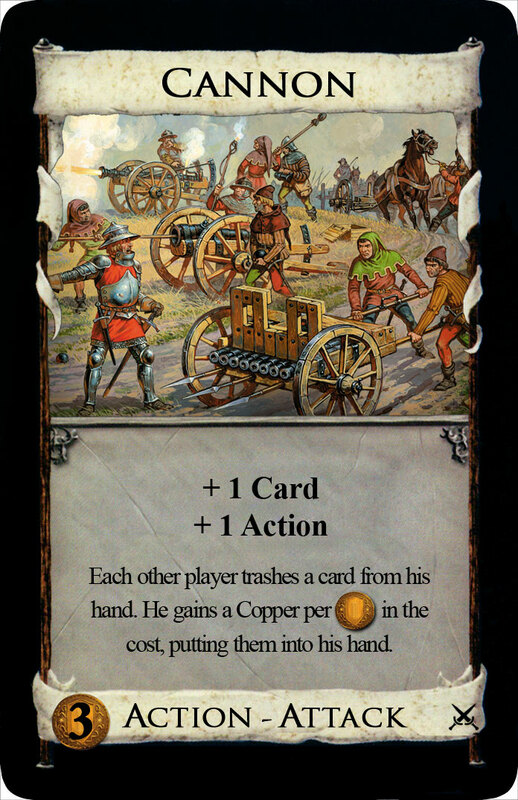 If the Supply of Coppers runs out players still trash a card and gain nothing (or as many Coppers as they can if there are fewer than the cost of the card). The player to your left reveals cards from his deck until revealing an Action card, then discards the rest. You may play that card. When that player's card leaves play, put it into his discard pile or on top of his deck, his choice. This allows you to play an Action card from your neighbor's deck. You do not keep their card past the end of your turn. It is always returned to its original owner, who decides whether it will go on top of their deck or discard pile. 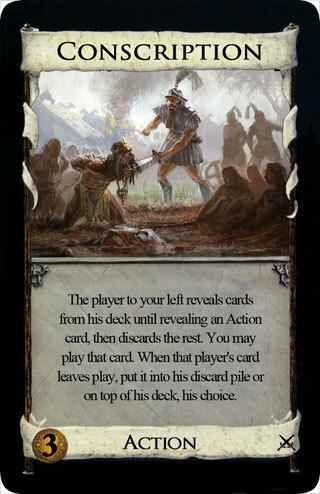 When the player reveals an Action from their deck, you may decide that you do not want to play it, which ends the action. You may not keep looking for an Action that you want beyond that first revealed one. If, after revealing all cards from the player's deck - including shuffling their discard into a new deck if need be - no Action is revealed, then Conscription does nothing. In any case, all other revealed cards are placed into that player's discard pile. 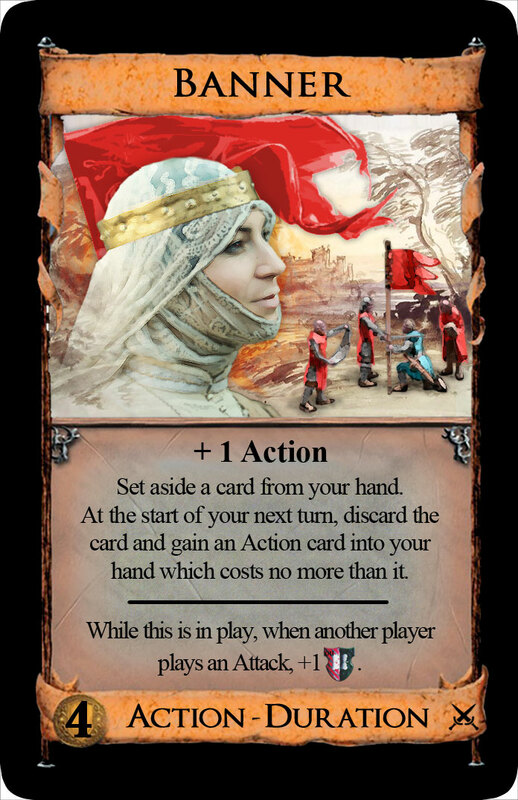 The conscripted card is treated as being yours until the end of your turn - unless it would be trashed, put into your deck, discard, play mat or any other area. In these cases, the card is set aside and returns to its owner at the end of your Clean up phase. When you play the card or set it aside, place the card in a way to indicate that it belongs to its original owner, so you don't lose track of who it belongs to. If multiple cards are conscripted on the same turn, you decide in what order their owner resolves putting them back into their deck or discard. This is not an Attack card. Put the top card of your deck into your discard pile. Look through your discard pile, choose a card, and put it on top of your deck. You must put the top card of our deck into your discard, it is not optional, nor is moving a card from your discard to the top of your deck. If your discard pile was empty before you played this, then you will put a card into your discard and then right back on top of your deck. This card lets you look through your discard pile, something you normally are not allowed to do. You only get to look through your discard pile when you play this. You do not have to show the other players your discard pile or the card you choose to take out. After you take out your card, you can leave the cards in your discard pile in any order. All players reveal a card from their hand simultaneously and discard it unless all other revealed cards have a lower cost. Then each player draws a card; if you did not discard, you may instead gain a Prize (from the Prize pile) or a Duchy. 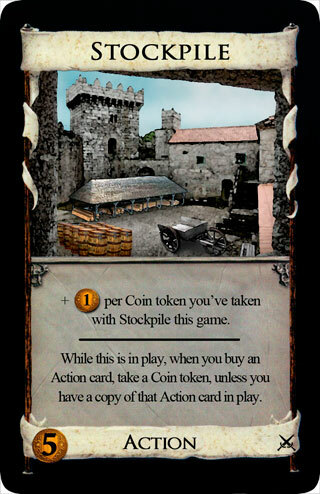 When playing with this card in a Kingdom set, add the Prizes from the Cornucopia expansion. 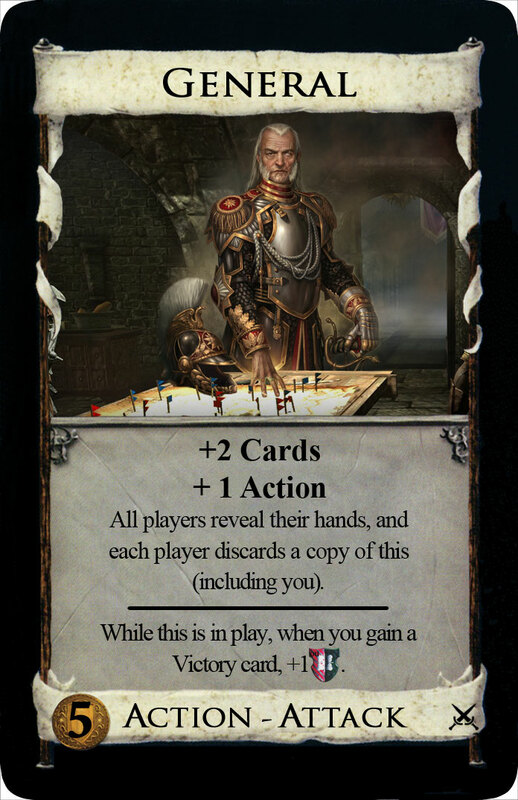 All players, including you, reveal a card simultaneously from their hands. Everyone chooses one of their cards in secret and then, when all are ready, players reveal their chosen card at the same time, and the cost of the revealed cards is compared. 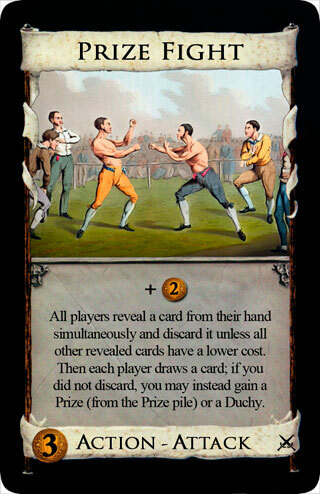 If the cost of their card is strictly higher than all other revealed cards, that player is said to have 'won' the prize fight and keeps their card, returning it to their hand - everyone else must discard their revealed card. It is possible to have no winner, if there is a tie and none of the cards has a higher cost than all the others, in which case all players discard their revealed cards. When playing with cards from Alchemy, mixed costs of Coins and Potions must be considered. These card costs might not be strictly comparable, so here too, there could be no winner. For example, if one player reveals a Silver and another player reveals a Transmute, there would be no winner. Next, all players draw a card. So most players would end up with the same size hand they started with, but a player who 'won' the Prize Fight would end up with a net +1 Card. If you were the winner, you may opt to not draw a card at this point, and instead gain a Prize or Duchy card. Unlike Tournament, the gained Prize goes into your discard pile, rather than on top of your deck. 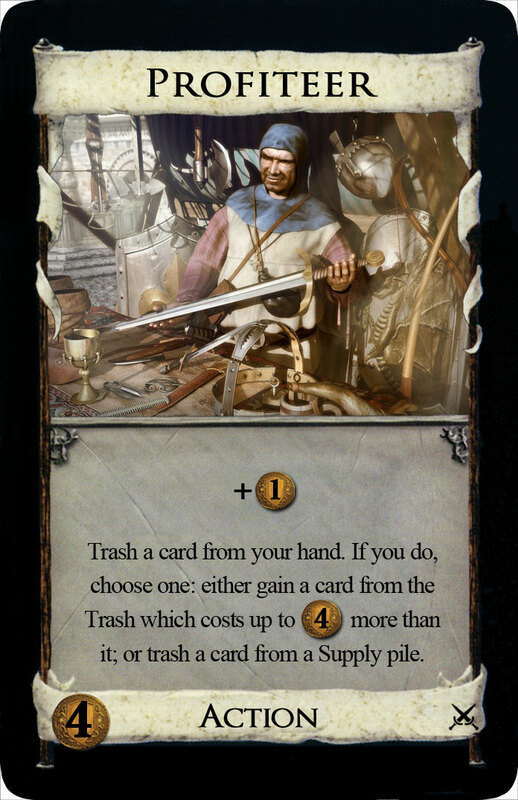 Trash the top card of your deck, and +2 Cards; or trash the top card of a Kingdom Supply pile, and +1 Card. You may pick only Supply piles to trash from, not special piles such as the Prizes (Cornucopia). If you trash the top card of your deck, you do so without looking at it first. This card provides no way to know what card you are trashing (although other cards played before it might tell you what the card is). Each other player with 4 or more cards in hand reveals a card from his hand. You may reveal a card from your hand. Each revealed card is either trashed, discarded, or put on top of its owner’s deck, your choice. 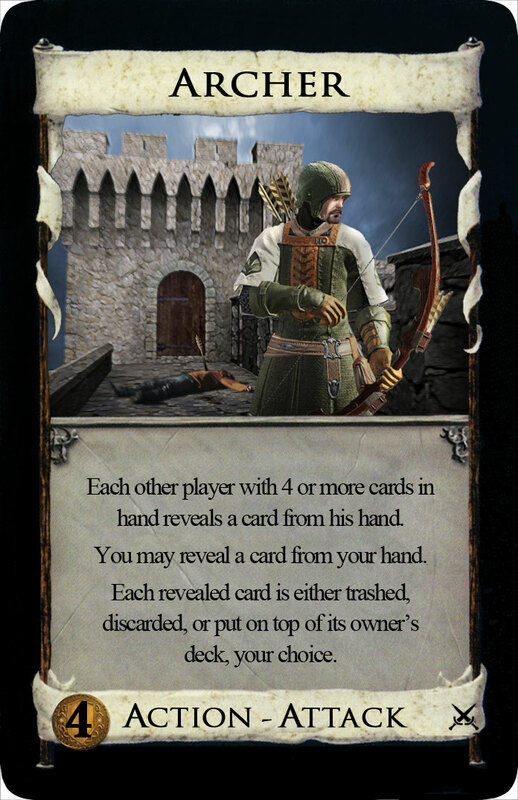 Players who had 3 or fewer cards in hand when Archer was played do not reveal any cards, but it is always an option for you to do so, because the hand size condition does not apply to you. You may make a different choice for what happens with each card. The card will go into the Trash or its owners deck or discard pile. Each player (including you) reveals their hand to the player on their left, who chooses a card for them to discard. For quick resolution, everyone can give their hand to their left hand neighbor simultaneously to allow them to choose which card must be discarded, and then get all their cards handed back. If sequential timing is important, each player goes around clockwise starting with you, resolving that choice. Apart from the two players involved, hands are not shown to any other players. Of course, the discarded cards will be visible to all. All players, including you, draw one card after they have discarded. Set aside a card from your hand. At the start of your next turn, discard the card and gain an Action card into your hand which costs no more than it. While this is in play, when another player plays an Attack, +1 Victory Point. Place the set aside card face up on the Banner to remember what it's for, until the start of your next turn, when you discard that card and gain an Action card directly into your hand. If there are Action cards available which cost equal or less than the set aside card, you must gain one of them. 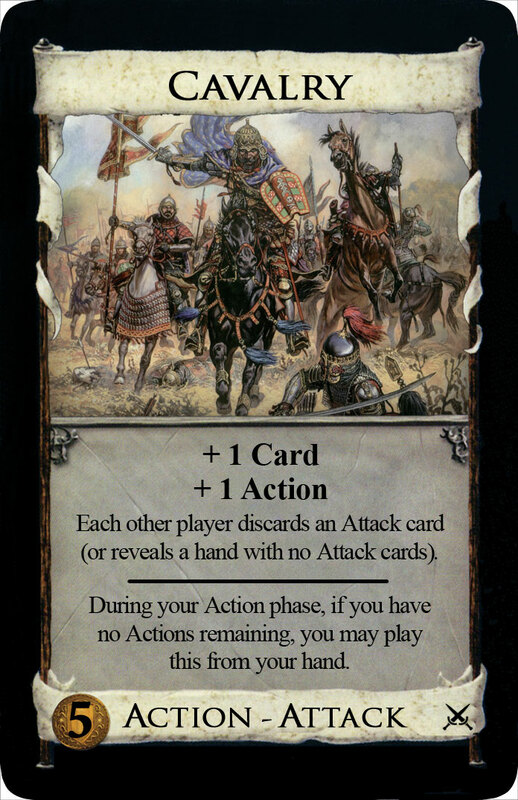 If there are no Action cards available which cost equal or less than the set aside card, you do not gain a card. If you do not have a card to set aside, or the set aside card is removed before the Duration completes (such as via the Admiral), then you do not gain a card. While this is in play, you gain a Victory Point every time an Attack is played by another player, per copy of Banner you have in play. For example, if you have two Banners in play and someone else plays Militia, you would gain +2 Victory Points. You get no points from your own Attacks. However if you Throne Room a Banner, despite having played the card twice, there is still only one copy of it in play, so it would only get you one Victory Point per Attack. Leave this card in front of you until the Clean-up phase of your next turn. Worth 1 Victory Point for each differently named Victory card which you have no fewer copies of in your deck than any other player. This is a Victory card and does nothing until the end of the game, at which time it provides an amount of Victory Points determined by the number and types of Victory cards each player has accumulated. When the final victory point scores are calculated, group your Victory cards by name and compare them to the number of cards in the same grouping that each other player has. 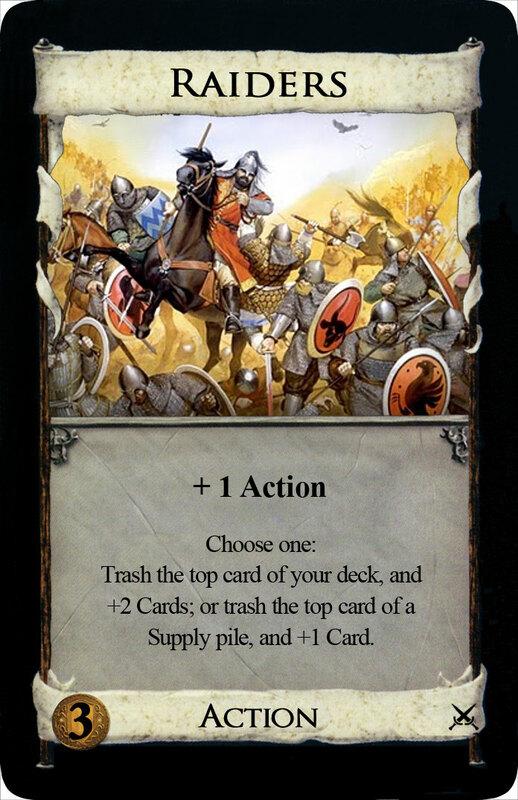 Compare cards in the standard Supply as well as all Kingdom cards which are Victory cards, including Battlefield itself. 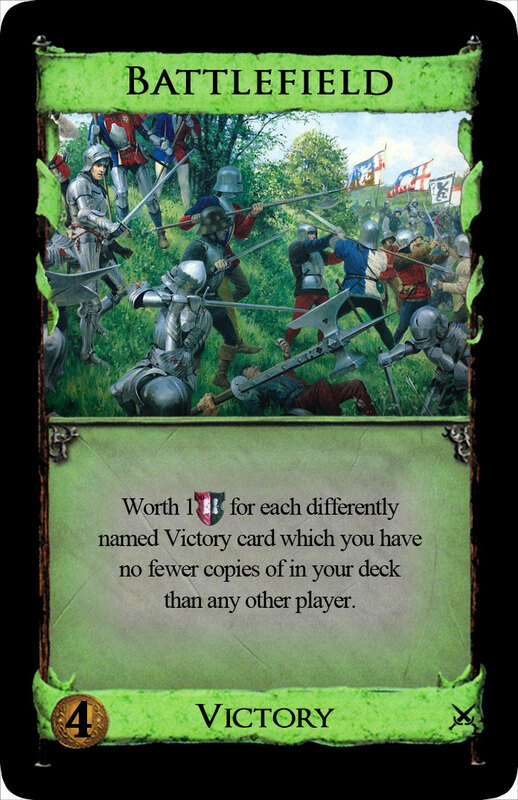 For each of these groups of Victory cards, if you have an equal or greater number than any other player, each of your Battlefields are worth one additional Victory Point. For example, if you have equal or more Estates and Battlefields than any other player, your Battlefields would be worth 2 Victory Points each. It is possible for your Battlefields to be worth 0 Victory Points if at least one other player has a higher number of Victory cards of each name than you do. The total Victory Point score or total number of Victory cards is not a factor, only the number of cards in each group that each player has. Each player (including you) reveals the top 3 cards of their deck, sets one of them aside that you choose on their Dungeon mat, and puts the rest back on top in an order they choose. After a player shuffles, they may put any card from their mat into their discard pile. When you gain this, each player takes a Dungeon mat. This card affects all players, including you. Each player shuffles their discard into their deck if necessary to get 3 cards to reveal, or just reveals as many as they can if they still have fewer than 3 cards. You pick one of the revealed cards from each player and they must place that card on their Dungeon mat, face up. The cards remain face up on their mat, and can be viewed by anyone. They do not have to be kept in any particular order. The remaining revealed cards are put back on top of their deck in any order the player wants, without showing the order to the other players. There is only one way a player can move a card from their Dungeon mat. When they form a new deck because they have run out of cards, after they shuffle and place the cards into their new deck, they may choose any one card from their Dungeon mat and place it in their discard pile. This means that card will not cycle into that player's deck until they have played through their newly formed deck. In cases when a player does not have any cards in their discard pile with which to form a new deck, they are still allowed to move a card from their Dungeon mat to their discard pile. The event which triggered the formation of the empty deck will still fail to find a card, but the next such event will get that card which was released from the Dungeon mat. For example, if a player has no cards in her deck or discard piles and she plays a Laboratory: she attempts to draw a card and would have to form a new deck, which would still be empty, and so she would draw nothing. At that point, she could place a card from her Dungeon mat into her discard pile. Then the second draw would happen, and she shuffles that one card from her discard pile into her deck and draws it. 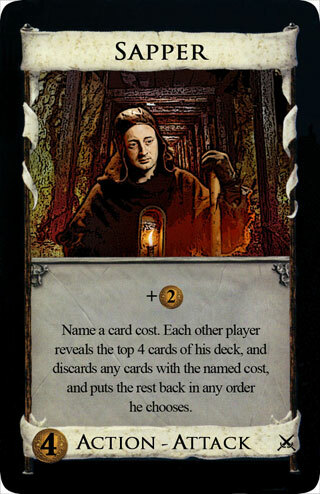 Once again, another card could be released from the Dungeon, although it would not be drawn by this Laboratory, because it had completed resolving. Only a maximum of one card can be put into the discard pile when the opportunity arises, but there is no obligation to do so. 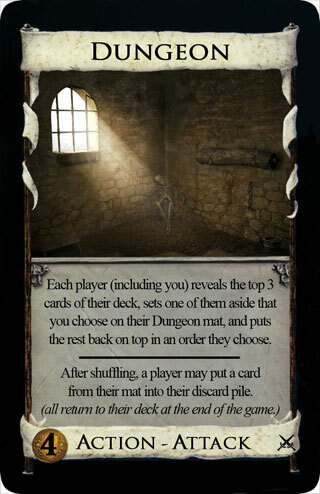 Cards can stay on the Dungeon mat until the end of the game, when they return to their player's decks for scoring. If it is not the named type, discard a card. Specified the three main card type choices. Complete change of concept (old mechanic reused in Squire Card). Clearly name one of the card types to make this choice known to the other players. It does not necessarily have to be a card type in the Supply, but does have to be a type defined in the rules (e.g. "Treasure", "Action", "Attack", etc. "Cards starting with the letter S" is not a legitimate choice). Each player discards a card from the top of their deck, and if it is the type you named, you get +1 Card. If not, you must discard a card. Since order is important here, start with the player on your left and progress clockwise around the table. If a card is discarded which has more than one type, all that matters is whether at least one of the types matches the type you named. If you do, choose one: either gain a card from the Trash which costs up to 4 Coins more than it; or trash a card from a Supply pile. Option #1. You gain any card from the Trash, no matter who trashed it, as long as its cost is no more than 4 Coins higher than the card you trashed (or a cost 4 Coin card, if you did not have a card to trash). For example, if there were a Province in the Trash, you could gain it if you had trashed a Gold, but not if you had trashed a Silver. You must gain a card if there is one in the Trash. Option #2. Put the top card of any Supply pile into the Trash. This includes standard Supply piles and Kingdom Supply piles. It does not include special piles such as the Prizes from Cornucopia. Name a card cost. Each other player reveals the top 4 cards of his deck, and discards any cards with the named cost, and puts the rest back in any order he chooses. Name a cost in Coins (and/or Potions) which will apply to all players. If any of the 4 cards each player reveals has exactly that cost it must be discarded. A player could potentially discard all of their revealed cards, none of them, or some number in between. For example, if you named "3 Coins", each player would have to discard any Silver, and any other cards which had that cost, that they revealed. You may name any card cost, even one which does not match any card, in which case the other players won't have any risk of discarding any cards. If there aren't 4 cards left in a player's deck, they reveal as many as they can, then shuffle their discard pile, and reveal the rest. If there still aren't 4 cards, they just reveal as many as are left. Each player may put the remaining cards back in any order they like, without showing other players the new order. All other copies of this in play are discarded (belonging to any player). At the start of your next turn, + 2 Cards. 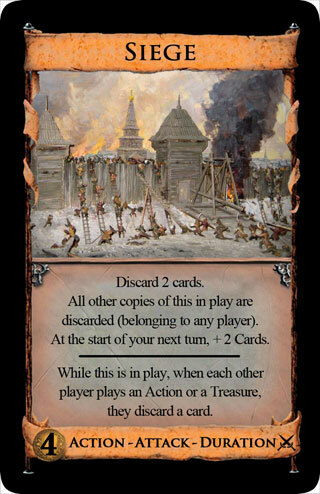 While this is in play, when each other player plays an Action or a Treasure, they discard a card. Discard 2 Cards when you play this, and at the start of your next turn draw 2 Cards. If this card is removed from play before your next turn (by another Siege card, for example), you will not get to draw the 2 Cards. When Siege is played, all other copies of it are discarded from play, including your own. When played multiple times by effects like the Throne Room, there isn't another copy in play, so the card is not removed. However, the persistent effect on other players only counts copies in play, so a Siege played via King's Court will still only force other players to discard one card per card played, not 3. While this is in play, any time another player plays any card they must immediately discard a card, before their card has any effects. The owner of the Siege is not affected by this. One card must be discarded for each card played, as they are played. If player doesn't have any more cards to discard, they can still play the last card from their hand. For example, a player who has 5 Coppers in hand could play a Copper, discard a Copper; play another Copper, discard another Copper; and finally play their last Copper, resulting in a total of 3 Coins for their Buy phase, instead of 5. Revealing a Reaction would force a discard, just as playing an Action on the table. A card which protects against attacks, like Moat, can be revealed when Siege is first played and will provide protection for as long as the Siege is in play. Revealing the Moat on later turns is too late. 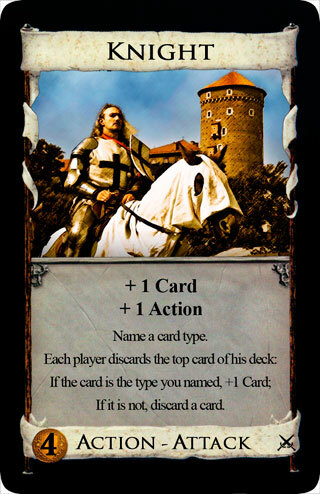 Use player tokens, as described in the Duration-Attack rules to remember that a particular player is immune to a Siege. This immunity includes not having to discard any Siege the defender has in play. In this way multiple Siege cards can be in play at the same time. If there are multiple copies of Siege in play, the discard effect stacks. 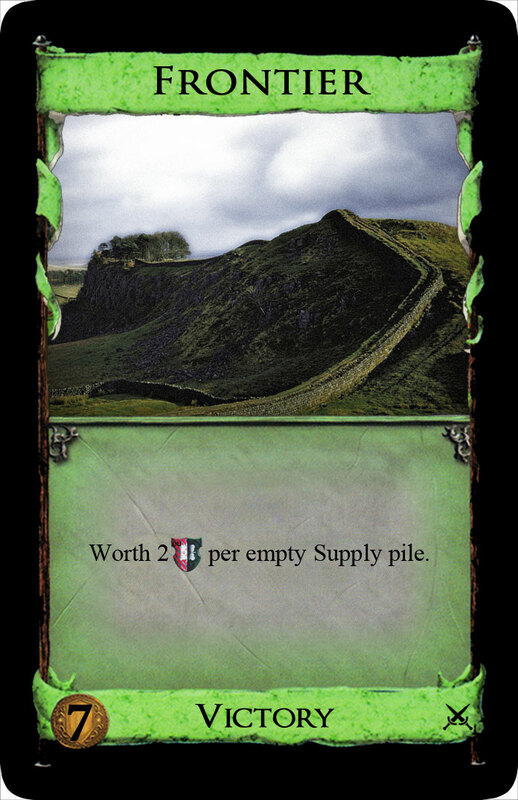 So if there are two Sieges in play, every time a card is played, two cards must be discarded (not for everyone though, keep in mind players are immune to their own Siege). If it isn't removed prematurely, Siege will remain in play until the Clean-up phase of your next turn. Each other player must return a Victory card in their hand to the Supply. If they have more than one Victory card in hand, they may choose one among them. They are not required to gain a Victory card, but if they do, it must cost less than the card they returned to the Supply. For example, if the only Kingdom Victory card in a set was Vineyard, a player with a Duchy in hand would only be able to gain an Estate, or nothing, when hit by the Soldiers, because the Potion cost of the Vineyard is not less than 5 Coins. 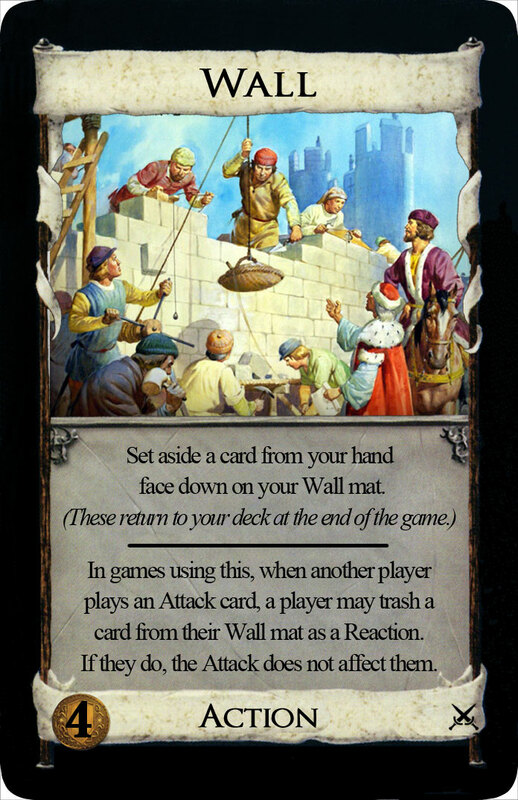 In games using this, when another player plays an Attack card, a player may trash a card from their Wall mat as a Reaction. If they do, the Attack does not affect them. When you gain this, take a Wall mat. When you play this, choose a card from your hand and set it aside, face down on your Wall mat. Other players don't get to see which cards you put there. You can look at the cards on your Wall mat at any time. When another player plays an Attack, you may trash a card of your choice from your Wall mat. This does not require you to have the Wall card in play, in hand, or even in your deck. As long as you trash a card from your Wall mat this provides protection from the Attack, in the same way revealing a Moat does. However, if you have no cards on your Wall mat to trash, then it does nothing. This defense is only against a single Attack. If several Attacks are played against you on a turn, you would need to trash multiple cards to protect against each one. Cards remaining on a player's Wall mat are returned to their player's decks for scoring. Each other player discards an Attack card (or reveals a hand with no Attack cards). During your Action phase, if you have no Actions remaining, you may play this from your hand. Other players must discard one and only one Attack card. If they do not have an Attack card, they must reveal their hand for all players to see. If you are in your Action phase and have used up all your Actions, you may play this out of your hand as though you had +1 Action. If you do have Actions remaining when you play this, it uses up an Action, as normal. All players reveal their hands, and each player discards a copy of this (including you). You and all other players must reveal your hands, regardless of whether anyone has a General card in hand. If you or anyone else does have a General, it is discarded. Only one needs to be discarded, even if a player has multiple copies. You gain the two cards before the reveal effect, so your newly gained cards are included in this check. While this is in play, when you gain a Victory card by any means you get +1 Victory Point. Multiple copies of Generals are cumulative, so you would get one Victory Point per General in play. However if you Throne Room a General, despite having played the card twice, there is still only one copy of it in play, so it would only get you one Victory Point per Victory card gained. Set aside a card from your hand face up. At the start of your next turn, trash it. While this is in play, at the start of each other player's Clean-up, he trashes a card of his from play that costs more than the set aside card. Put the set aside card face up on the Gibbet to remember what it's for. You have to set aside a card; it's not optional. Gibbet and the card stay there until the start of your next turn, at which point you put the set aside card into the trash. 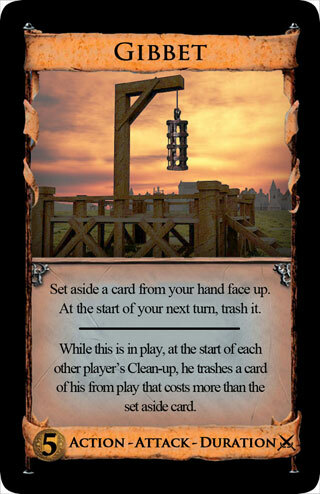 While the Gibbet is in play, before discarding cards on their Clean-up, each other player must trash a card from play. They choose which card, as long as it is valid. A valid card is one which has a higher cost than the set aside card, not an equal or lesser cost, or a cost which cannot be directly compared (as can happen with Potion costs). If the player does not have such a card in play, they do not have to trash a card. Only their cards from play can be trashed. Cards which were kept in hand, or are set aside, are not eligible, even if they meet the cost requirement. If you do not have a card in your hand to set aside, then play Gibbet alone. 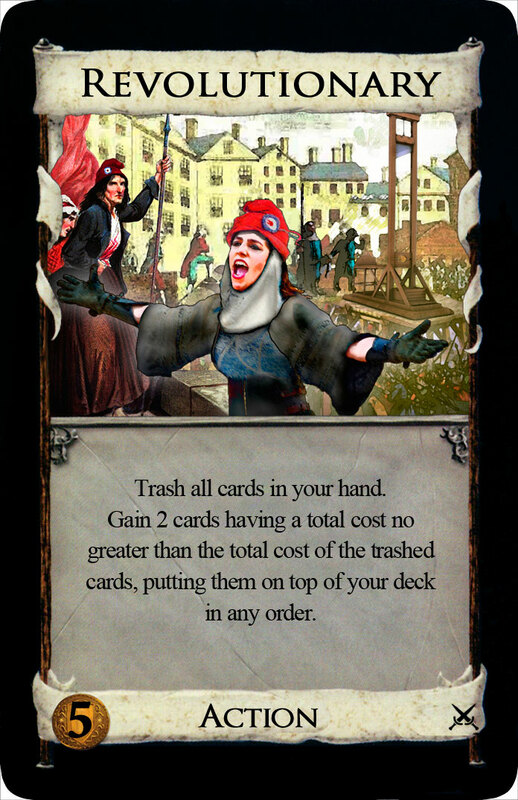 The requirement for other players to trash a card still stands, but they may pick any card without regard to cost. If there are multiple Gibbets in play, a card must be trashed for each one of them. It is possible to trash cards which are dependent on or modifying other cards which are not in play, thereby 'orphaning' them. The state of these orphan cards needs to be resolved, which is done by putting them into their owner's discard pile immediately. For example, if a player trashes a Haven from play, the card set aside with it will go straight into their discard pile. Cards on play mats, such as the Native Village mat, are unaffected. 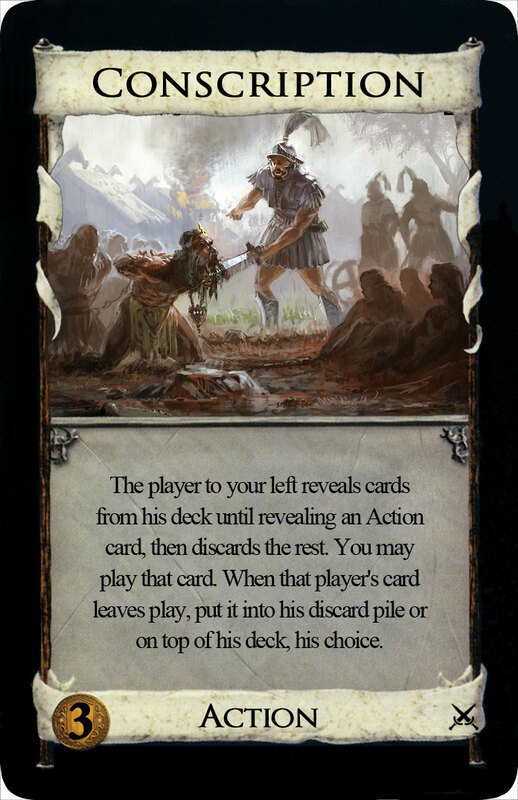 The active player can choose what order they resolve effects which are triggered at the same time, so they can choose have the trashing occur after any other card's "Start of Clean-up" effects. For example, at the start of their Clean-up a player may use the promotional card Walled Village to put itself on top of their deck, removing it from play and making it immune to the Gibbet (although it means another valid card might have to be trashed, instead). A card which protects against attacks, like Moat, can be revealed when Gibbet is first played and will provide protection for as long as the Gibbet is in play. Revealing on later turns, once it is already in play, is too late. 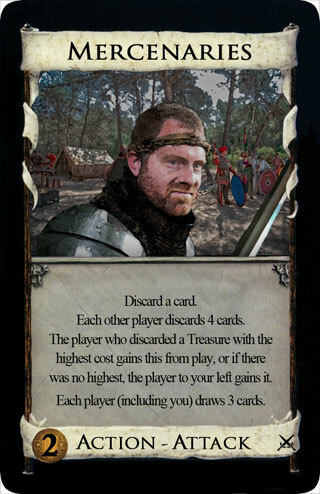 Use player tokens, as described in the Duration-Attack rules to remember that a particular player is immune to a Gibbet. Gibbet is discarded in the Clean-up phase of your next turn. Trash all cards in your hand. Gain 2 cards having a total cost no greater than the total cost of the trashed cards, putting them on top of your deck in any order. You must trash every card you have in your hand when you play this. Add together the costs in Coins (and Potions) of these trashed cards. This combined cost is your limit when selecting the cards you gain. You must gain exactly 2 cards, and these 2 cards must have a total cost that does not exceed that limit. For example, if you trashed your hand containing a Curse, a Silver and 2 Estates, this would be a total cost of 7 Coins. You could mix and match to get various combinations of two cards: a Gold and a Copper; or 2 Silvers; or a cost 3 card and a cost 4 card; etc. If you have no cards in your hand when you play this, you would have to gain 2 zero cost cards. + 1 Coin per Coin token you've taken with Stockpile this game. While this is in play, when you buy an Action card which you do not have in play, take a Coin token. trigger on buy not gain. edited for clarity. When you gain this, take a Stockpile mat, where you will keep the Coin tokens taken with Stockpile. This is worth 1 Coin for each Coin token on your Stockpile mat. The tokens are not expended and remain on the mat. Only buying Action cards gives you the Coin tokens, not gaining them in other ways, but if you can buy more than one Action a turn, or if you have multiple Stockpiles in play, you would gain multiple Coin tokens in a turn. However, if you King's Court a Stockpile, despite having played the card three times, there is still only one copy of it in play, so it would only get you one Coin token. You will never get a Coin token for buying another Stockpile, since it would be in play. Trash this card. Put a Tariff token on top of a Supply pile. Cards from a Supply pile cost 1 Coin more to buy per Tariff token on that pile. 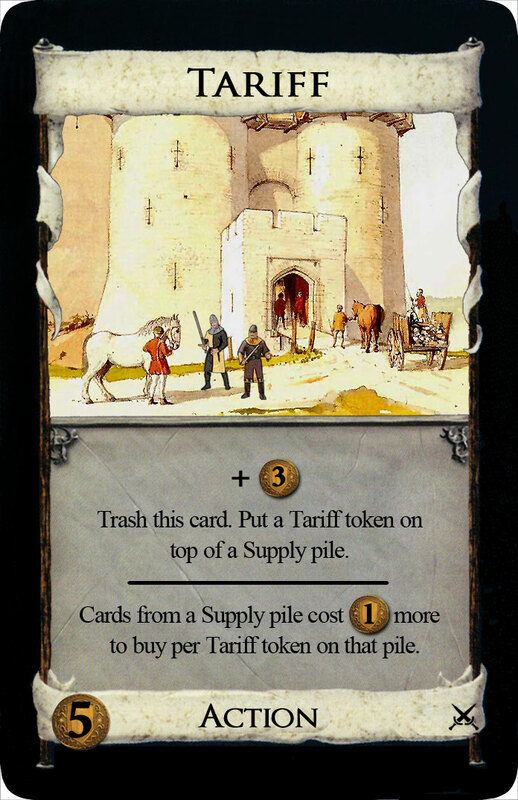 This card uses a new token type: Tariff tokens. Any home-made token can be used, or in games not using the Embargo card from Seaside, its tokens make a good substitute. You can pick any pile in the Supply. The cost of the cards in that pile are more only for the purposes of buying them. Gaining the cards by other means is unaffected. Unlike Bridge, the card costs are not affected universally. The cost will be higher for you too, and will be in effect for this turn's Buy phase. If multiple Tariff cards are used to put Tariff tokens on the same pile, the cost increase is cumulative +1 Coin per token. If you Throne Room a Tariff, you place two Tariff tokens and they do not have to go on the same Supply pile. The supply of Tariff tokens is not intended to be limited. If you run out, use another replacement token to mark affected piles. You may choose a card or token from each other player, which is in play, set aside, or on a mat. It is discarded. At the start of your next turn, gain a Victory card costing less Coin than your total number of Victory Points. You get one Victory Point token when you play this. 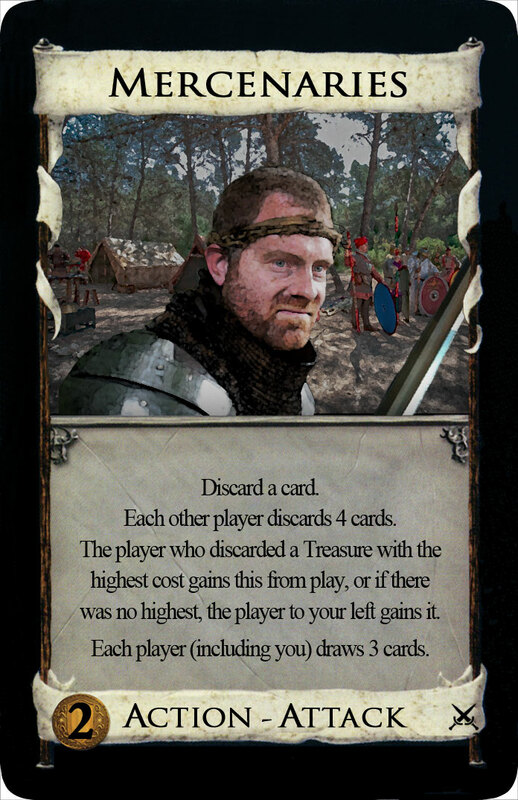 This card allows you to force each other player to discard an item of your choice: a card in play (a Duration, typically), a set aside card, or any type of token. Your choice of item may be different for each victim. Set aside cards may be targeted whether they are on a play mat or not, as long as they are in a game area under the control of a player. Cards in supply piles, the Trash or other such communal areas are not valid targets. You may not look at other player's face-down cards, so although you may choose a face-down card to be discarded, it must be done without peeking. 'Discarding' a token means returning it to the appropriate pile of tokens. The amount lost is always a single unit of what that token pile represents. You can't force the loss of a 5 point Victory Point token, for example. It is possible to remove cards which are dependent on or modifying other cards, thereby 'orphaning' them. If this is not handled by the cards in question, the state of these orphan cards needs to be resolved, which is done by putting them into their owner's discard pile immediately. For example, if you select a Gibbet which is being copied by a Throne Room, the Throne Room and the cards set aside by the Gibbet will go into that player's discard pile along with it. 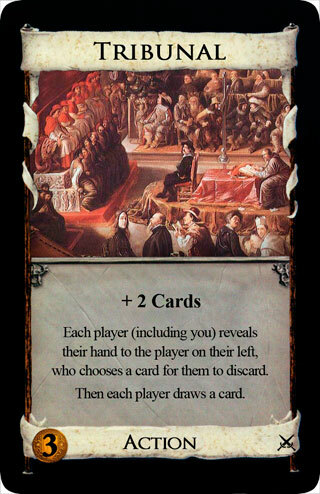 However, if you instead targeted a card set aside with Gibbet, the Gibbet would stay in play, because the state of having no set aside card is handled by the rules of the Gibbet card (and the Throne room would stay in play modifying it). A card which protects against attacks, like Moat, can be revealed when Admiral is played and will provide protection for as long as the Admiral is in play, but since there is only an initial attack effect on other players, the defense does not need to be resolved any differently and the tracking required with other Duration-Attacks in not necessary. 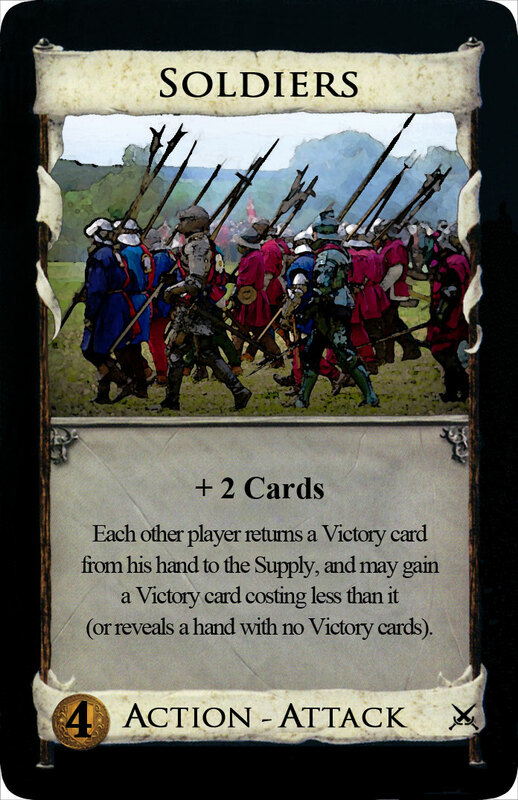 On your next turn you must gain a Victory card from the Supply costing less than the number of Victory Points you have accumulated, as long as there is a Victory card available meeting that condition. 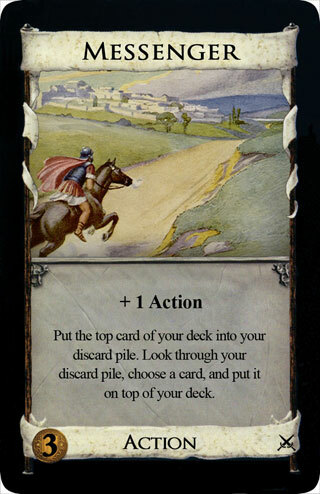 All Victory Points are considered, this does not distinguish between Victory Points taken with this card and others, such as Monument. 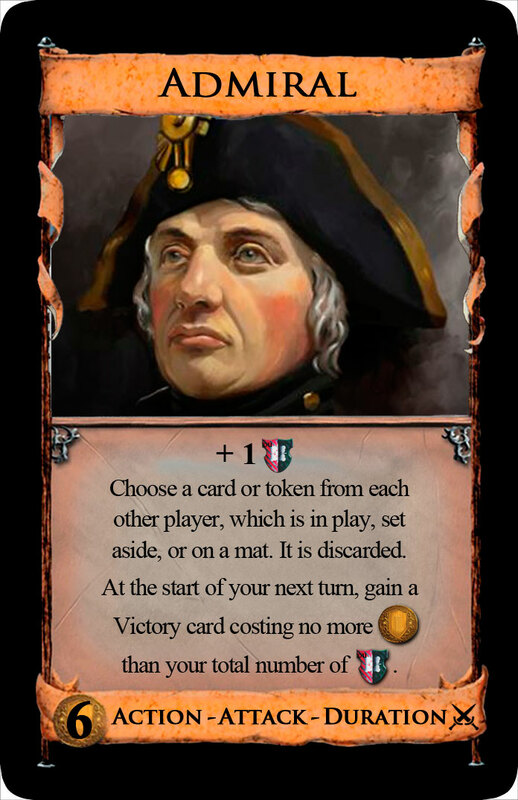 If this card is removed from play before your next turn (by another Admiral, for example), you will not gain the Victory card. Worth 2 Victory Points per empty Supply pile. This is a Victory card and does nothing until the end of the game, at which time it provides 2 Victory Points for each Supply pile which has ended up empty, so it would usually be worth either 2, 4 or 6 Victory Points. Only empty Supply piles count for this, or special piles considered as Supply piles, like the Bane pile from Cornucopia, but not other piles like the Prizes pile or Trash pile. It is possible for more than 3 Supply piles to be empty, if the last player emptied multiple piles during his or her turn.